If you keep your chickens in a fully fledged building with insulation and real walls etc. then you’re all set for winter. 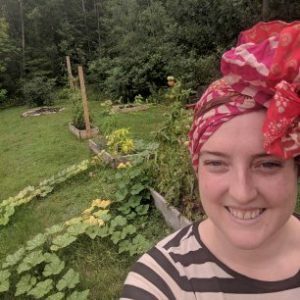 When we built our little tractor this summer, I knew that I wanted to keep the hens through the winter, but still hadn’t decided how we would go about that. We have a large shed that we currently aren’t using for anything, and I think down the line that will become the layer coop and we can use the tractor for meat birds. For the time being though, we have this small coop, on wheels, mostly made of plywood and 2x4s. Firstly, I know lots of people have different opinions on keeping chickens warm in the winter. 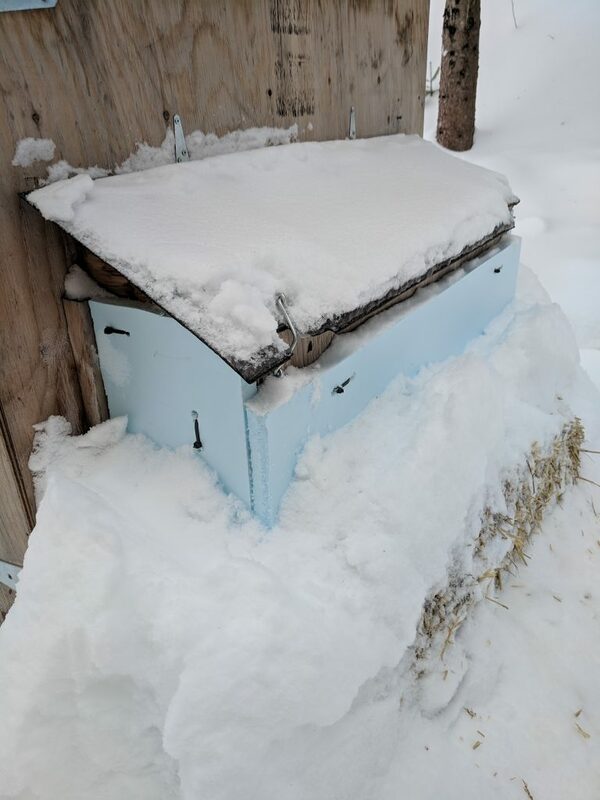 I am, in general, of the belief that if you have a cold hardy variety, and they have shelter from moisture, wind, and can get up off the snow, they will survive the winter. My concern was that our little coop can only partially do these things. Our property is also on a north facing hill, so when those harsh Nor’easters start rollin in, it can get pretty bitter. 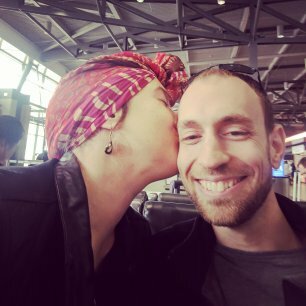 So wind protection was the first thing added to the list. 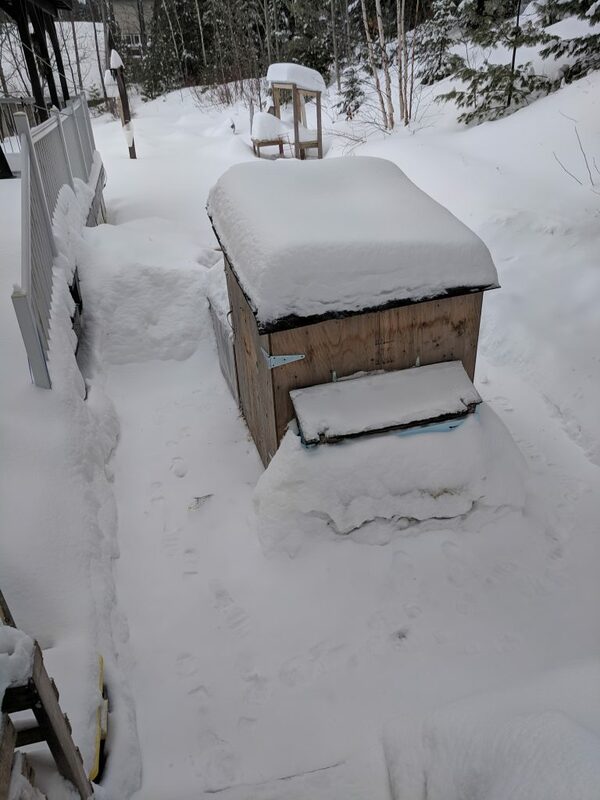 Giving the chickens somewhere to get off the snow wasn’t super hard, they can already go inside the small coop. I checked for any small gaps where snow might have come in a sealed them. If I can keep out the snow, I can keep out the moisture. My next thoughts went to temperature. A lot of folks I know of who keep chickens in small coops and tractors live in lovely climates with mild winters. Our winters get cold. Extremely cold. 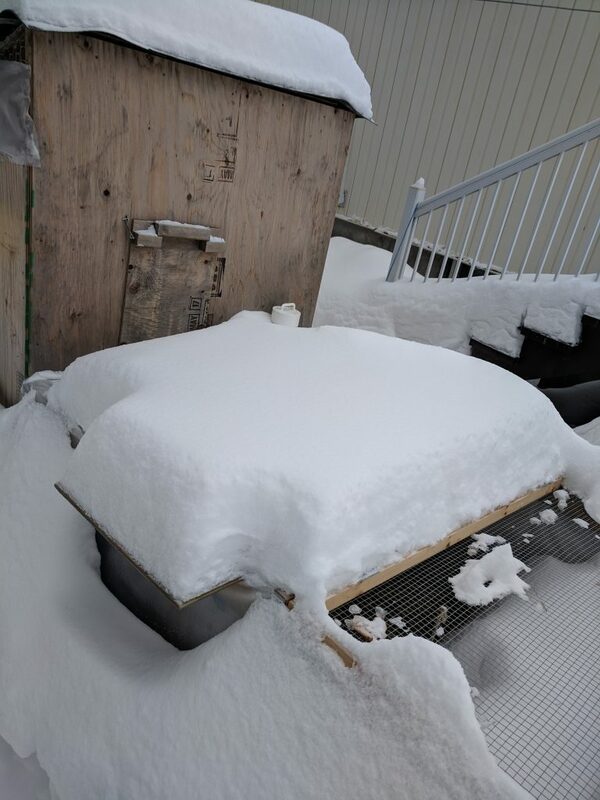 Like, -40C sometimes. I needed a definitive answer about how cold is too cold for a chicken. No one seemed to have a straight forward answer. Most of my canadian chicken owning friends use real buildings with proper walls. 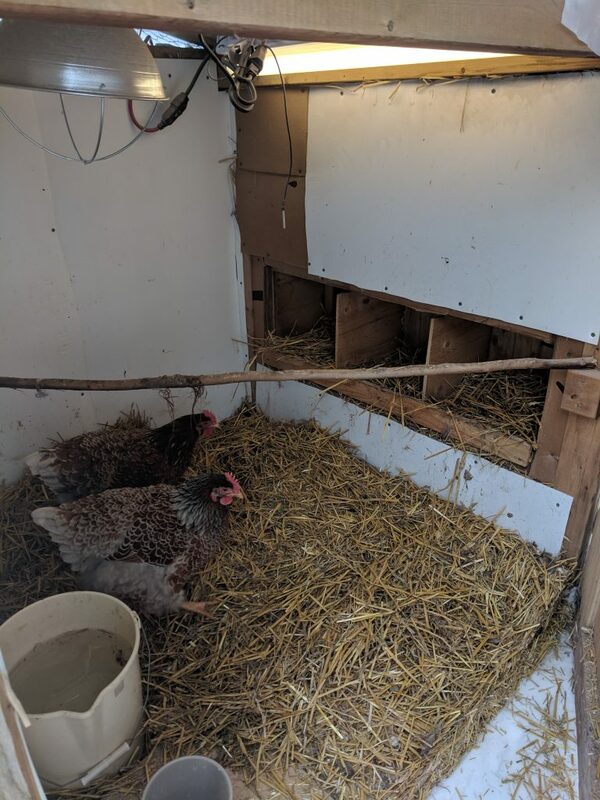 These will insulate and keep the temperature inside comparatively warmer than outside, but nobody that I know keeps a thermometer inside the coop. By standing in a few on those really cold days, I decided to make a decision about how cold it felt, and use that as my basis. I went with -20C as my coldest threshold. To start with wind protection was pretty easy, and inadvertently gave the solution to snow build up. Leaving a 2×4” long gap at the far end of the run, away from the door, I covered the chicken wire run with Vapor Barrier. The plastic sheeting used in walls to prevent moisture damage. I got the idea from closing the family cottage at the end of the season. We would staple large plastic sheets over the screen porch to prevent moisture and wind damage. This worked really well, and because of the open gap at the end, it still allowed air flow and for a bit of snow to get in. 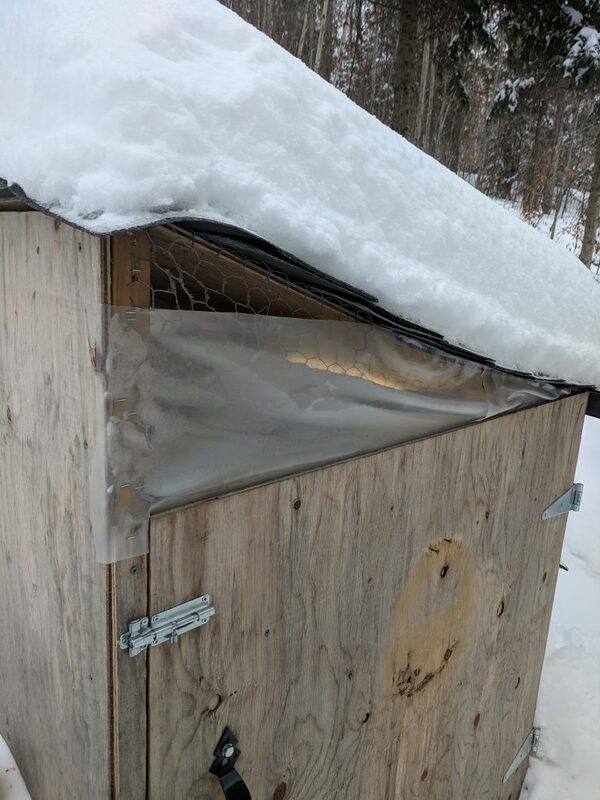 Even though I replace the water everyday anyways, on those super harsh days it’s good to let the chickens have access to snow in case their water freezes. Preventing too much moisture build up inside the coop mostly just meant patching up any small gaps, and shingling the roof. The coop also has a couple window holes at the top of two walls. I didn’t want to seal these off completely in case of condensation, but left fully open they would allow freezing drafts to get into the coop. In the end I used more vapor barrier to cover about 80% of each, leaving a small gap at the top to allow humid air to escape. Lastly, maintaining temperature. Putting a heater in the coop worried me a little bit. 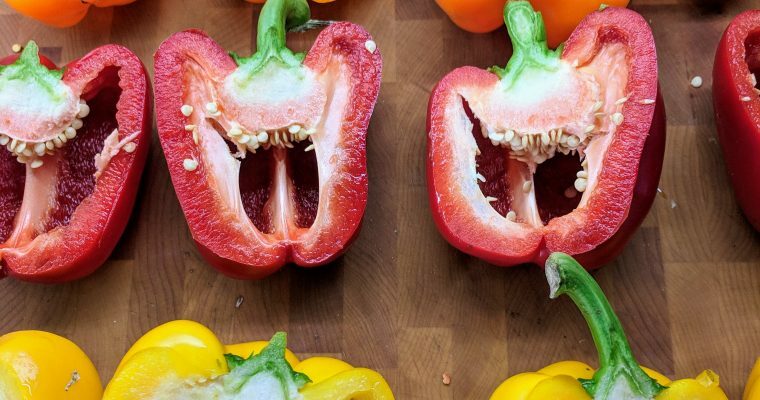 I had heard a lot of conflicting things about them, but in the end we used one. For safety reasons we didn’t use a huge one and it ended up being a sort of supplementary heater. We wanted the inside temperature to be warmer than the outside, but not ultra hot or even that warm. It simply needed to be more bearable then outside. Our girls are cold hardy breeds so they should have the feather density to tough it out. Our plan was to insulate the walls and nesting boxes with something that could be removed in the spring. Allowing us to maintain a warmer temperature then the outside air. I used a large sheet of corrugated plastic that I got from a car dealership. (It was one of their huge sale signs that they weren’t using anymore) I measured and cut it then screwed strips of it onto the inside 2x4s of the coop frame. This left a gap between the corrugated plastic and the plywood, which I stuffed with straw. Around the nest boxes I used a sheet of foam insulation. I also put a hay bale underneath to prevent snow buildup underneath potentially damaging the wood. 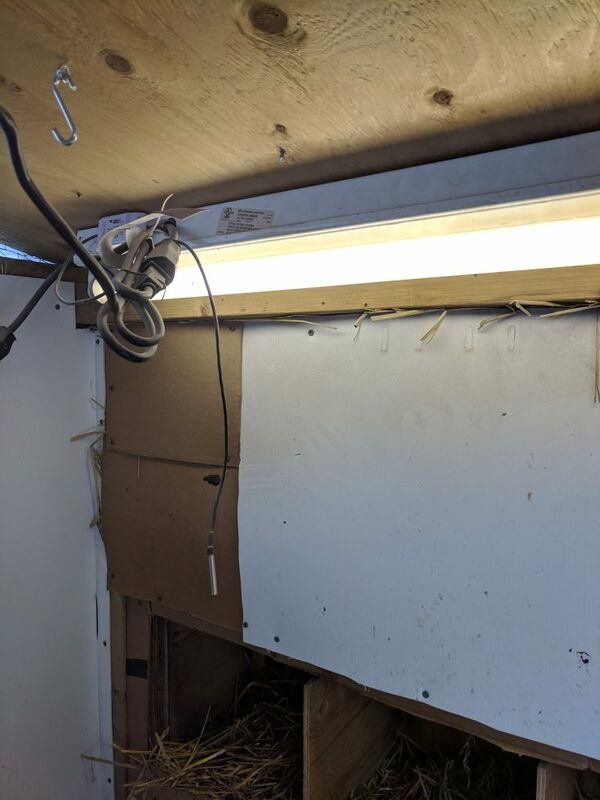 Once all the insulation was in place, and the heater was added, it successfully held the temperature about 10 degrees higher than the outside temp. Not as amazing as I was hoping for, but so far everyone seems happy. 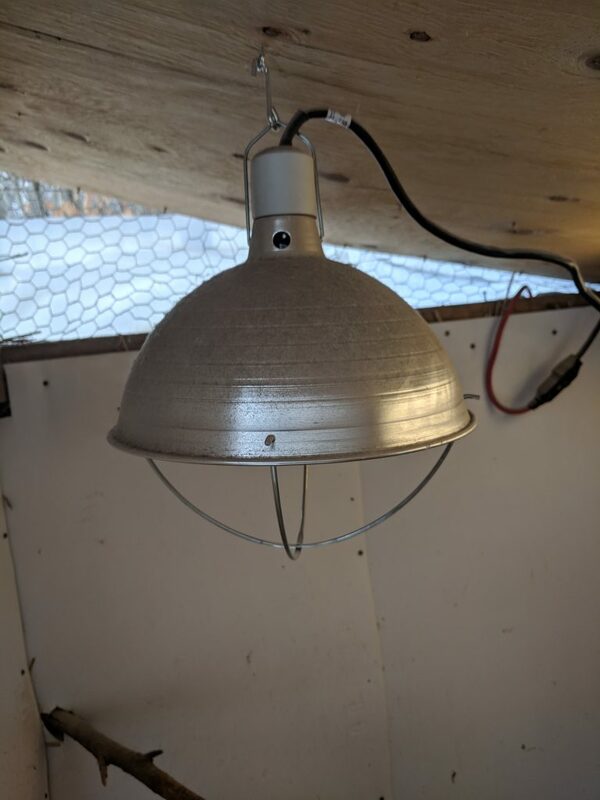 There’s been no signs of frost bitten chickens and only a few broken eggs.. (which is simply inevitable) We also added a light to help us to keep getting eggs, and it also lets off a touch of warmth. 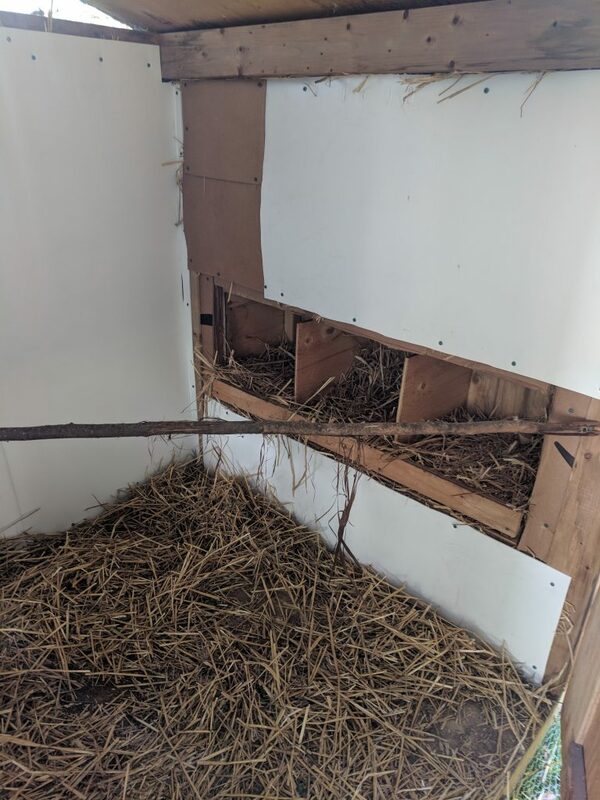 Though the deep litter method doesn’t work perfectly in a super small chicken coop, I have been layering in lots of fresh straw regularly. This helps create a barrier from the frozen ground under the floor. There’s a temperature sensor that we have hooked into our home automation that controls the heater. The light has been wired into our system as well so that we can adjust the light hours. 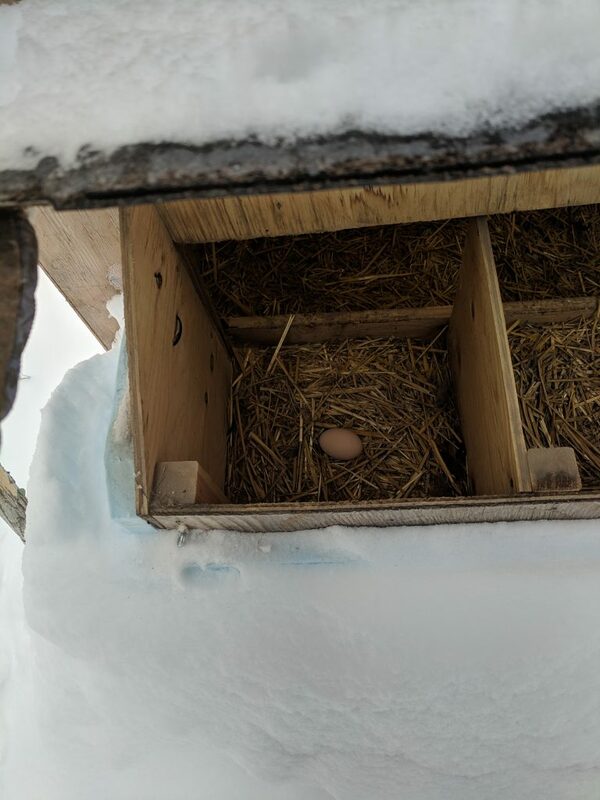 The coldest temperatures we’ve had inside the coop so far this winter were right around -23C. And we’ve had no problems with our chickens. Digging the coop out of the snow every morning has been fun, and our mounds of shovelled snow are getting pretty big. All in all the winterizing has been successful. 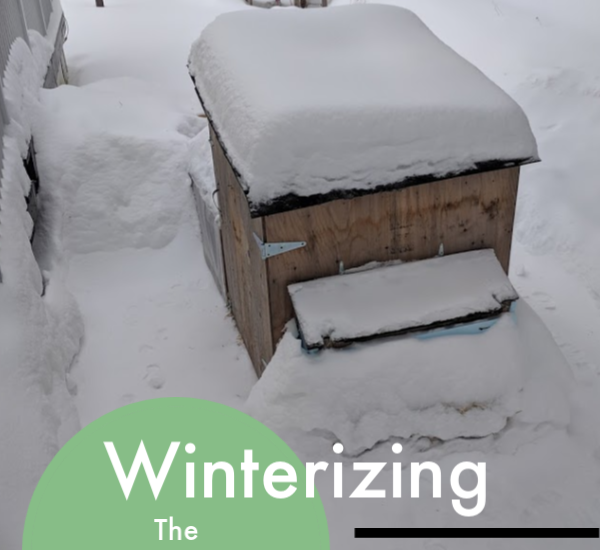 How do you prep your chickens and coop for the winter? Drop me a comment and share your tips!